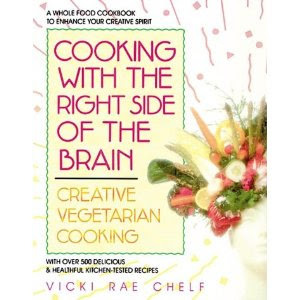 One of my favorite nutritious snacks to pack for the beach or other outings comes from a beloved cookbook, Cooking With The Right Side Of The Brain: Creative Vegetarian Cooking by Vicki Rae Chelf. My family loves these hearty and nutritious bars. They are dense, which is what makes them the perfect picnic snack, as they are good fuel for busy kids. I have modified the recipe considerably to make them easier to put together. For the filling, remove stems from 3 pounds of dried figs and add to large pot with 1 1/2 cups of water, plus 1/4 cup additional if needed. Stir often and cook until soft, remove from heat to cool. For the dough, mix together in a large bowl, 6 cups whole wheat pastry flour or unbleached wheat flour, 4 cups rice flour and 2 tsps nutmeg. Add 1 1/2 cups oil to the flour mixture and work together in mixer or with your hands. In separate bowl, beat together 3 eggs, 1 cup honey and 4 tsps vanilla. Then add liquid mixture to flour and mix well until dough is crumbly but can be made into a ball. Form dough into large ball and cover with towel or plastic wrap to keep moist and set aside. For filling, puree the cooked figs in a food processor or blender (by adding a little at a time) and add additional water if necessary to achieve paste. Set aside. Divide the dough in half and roll or pat one half onto unoiled 11 1/2 x 17 1/2 inch cookie sheet. Spread filling over dough. Roll remaining dough onto wax paper to make same size rectangle. Carefully transfer to sheet to top of filling and peel off wax paper. Prick the dough with a fork and place in oven heated to 350F for 30 minutes. 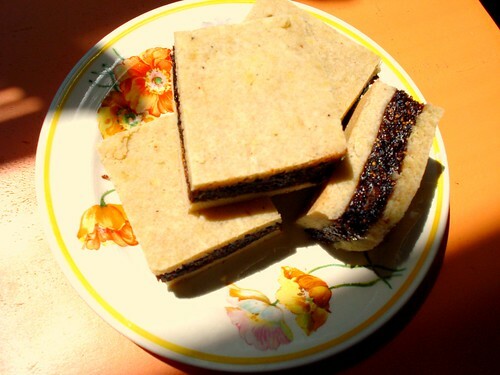 When the bars are baked, remove from oven and cut into bars and remove after cooling. You'll have lots and the extra freeze very well. I haven't yet experimented using other fruit, as the fruit mixture needs to be rather thick and pasty, but I'm sure it's possible to use up last season's frozen berries, for instance, if you adjust for moisture content. Amy, I just wanted to tell you how much I love your blog. Always thoughtful and interesting, and so visually striking. I always look forward to your new posts. trying this *soon* - thanks for sharing!